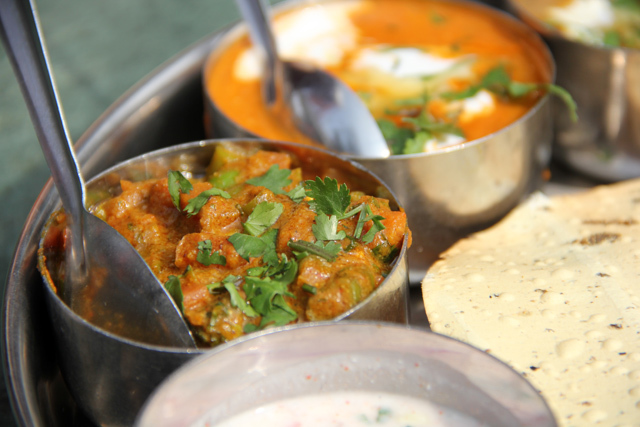 India is a vast country and home to a diverse range of cuisine. North Indian food is far different from Northeastern Indian food or South Indian food, and if you get even more specific, each and every region is famous for its own certain dishes. After visiting a few of the major cities in the North of India, and dining on lots of local food, I'll try to cover a few of the general things that I noticed distinctly about North Indian food. North Indian food is often what many people would think of as just Indian food. It's the North Indian curries that are often found outside of India in Western restaurants (but don't forget about South Indian food either – it's equally as delicious, but different). Within North India you'll find everything from street stalls to high end restaurants like Bukhara, all serving classic North Indian fare. Common cooking methods include deep frying for many of the snacks, grilling or roasting for meat, and slow simmer stewing for all sorts of curries. As soon as you arrive in India and start eating, you'll notice that there's a lot of vegetarian food and restaurants available. If you are vegetarian, you'll enjoy the variety of tasty pure-veg dishes, and if you're a meat eater, you'll never be far from outstanding meat either! While rice is the ultimate staple in much of the South portion of India, in the North, while rice is often available, a meal is never complete without bread. 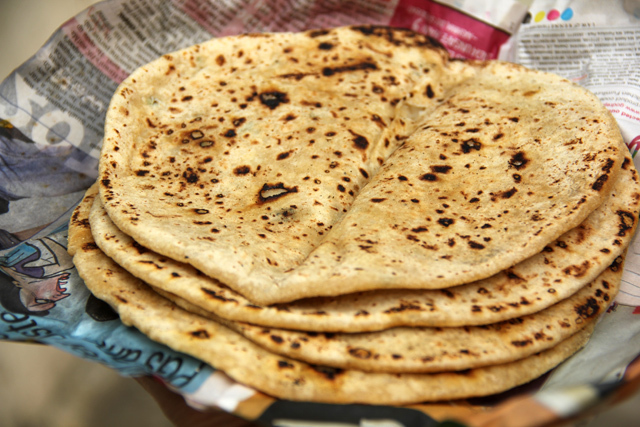 Tandoori roti, chapati, naan, and many other types of flat breads are extremely popular and vital for all North Indian meals. Bread is used as the main filler and as a great way to scoop us sauces. Dal, or lentils, is one of the most essential foods in all of India. North Indian styles of dal curry are normally a little thicker and richer than South Indian variations. It's not uncommon for someone just to eat dal and bread for a meal. For more substantial main dishes, a diversity of curries and barbecue meats are always available. 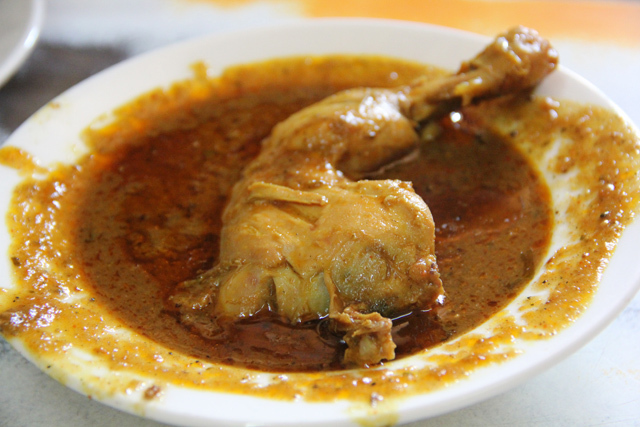 Chicken, beef, mutton, and eggs are all stewed in lots of spices and ghee (clarified butter). The thick rich sauces are truly marvelous. North India is also extremely famous for its barbecued meats. Tandoori chicken, chicken that's been marinated in spices and yogurt and then roasted in a clay oven known as a tandoor, is one of the most famous. Common vegetables include potatoes, peas, okra, onions, carrots, and all sorts of beans. Green leafy vegetables are not all that common, but rather vegetables which go well in curries. Dairy plays a huge role in North Indian food. Paneer, a hearty cheese, is one of the most popular main ingredients, especially for those that are vegetarian and need protein. Thick full-fat yogurt is heavily used in snacks known as chaats, and also is often served along with any normal thali (a fixed meal including a variety of dishes and starch). Milk and products of milk form the foundation of many of the North Indian sweet desserts as well. One comfort food that I especially enjoyed eating while in Delhi is a dish known as chole bhature. Chickpeas are curried in plenty of spices and dished up with chillies and onions, and garnished with cilantro. 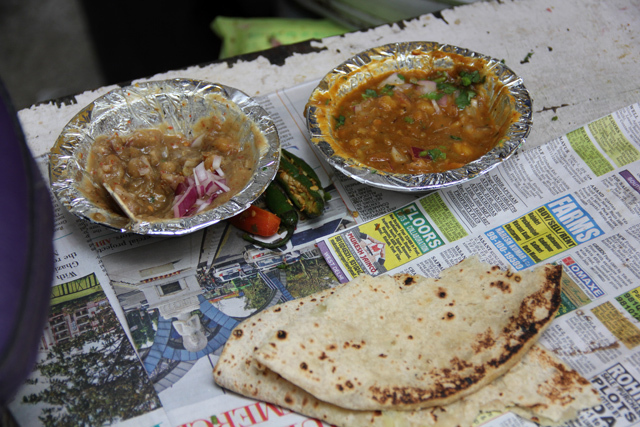 It's available all over the streets of Delhi and usually eaten along with a few freshly grilled chapatis. North Indian food is a joy to eat; It's rich, extremely satisfying, and packed full of spicy flavor!